This machine is for cutting and chamfering slab. The table has the sealed oil filled guide, driven by the rack and pinion moved by the handwheel, the blade spindle can rotates manually; it has compact structure and easy to move. Yuxiang is a specialized manufacturer of Granite & Marble cutting equipment, including Manual Edge Cutting Machine, Special-Shaped Edge Cutting Machine, granite edge cutting machine, marble edge cutting machine, laser cutting machine, marble cutting board, cutting marble tile, cutting granite tool. Since first recommended in 90’s, the Manual Edge Cutting Machine has been widely accepted by the market with the features of compact structure, high precision, stable performance, easy maintenance, high capacity and low power consumption. This Edge Cutting Machine is preferred equipment for cutting and chamfering high-value granite & marble edge and special-shaped edge at different thickness and sizes. The table of granite edge cutting machine has the sealed oil filled guide, driven by the rack and pinion moved by the handwheel, the blade spindle can rotates manually; Special-Shaped Edge Cutting Machine adopts jointed structure, with trolley driven by hand. Manual Edge Cutting Machine is the unique equipment for accurate dimension and specification, including straight and smooth edge with flexible movement of blade. With combination structure, rotatable cutting head, the cutting head of main drive in Manual Edge Cutting Machine can rotate 45 degrees, and oil-immersed sealed rails, The great strength and high efficiency of the Special-Shaped Edge Cutting Machine makes it possible to process various granite edge. 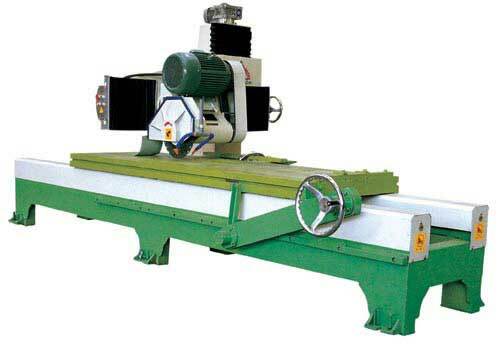 The Manual Edge Cutting Machine is compact in structure and applicable for edge trimming and chamfering of small slabs, slab bars and thick slabs.